When a story is told we follow along with the main character and await the challenge or the crux of the story – the adventure, and then we listen or watch as the hero decides what to do. The events have already happened, that’s why the story can be told, but the piece we didn’t need to think about was how the characters in the story made their real-time choices and thus those actions or inactions that moved the story forward. Let’s talk about that power. As the author of your life story every moment you are moving your story forward. Every choice, every action creates ripples, creates responses, closes doors, open doors, hurts, helps, generates energy and creates your future. Will you enjoy poetry and tea and snuggling with a cute little Yorkie to start your day, as I did this morning? Will you start off choosing actions that make YOUR soul sing, or create love? Will you fight off fear that may loom about your day ahead? Will you yell at your kids, or take a run, or take someone for granted, or listen to an inspirational podcast that may trigger an action that will change up your day and maybe your story? Will you allow your inner critic to rip into you today, or will you manage your inner stories? The choices are endless – really, you could create anything. What will you create today? Right now? What is your storyline? Is it on autopilot or can you shake it up for a little novelty? Maybe just what you need today is to do something completely unexpected. Ooohhhhh – what might that be and where might that take you? Do it! One of the tag-lines of Love Your Story is that it seeks to empower and inspire you to create your best life story on purpose. This statement exudes personal responsibility, but it also glows with power. This is not to say that you caused everything that happened to you in your life. I’m never a fan of that theory, but it is to say that your thoughts, your perceptions, your actions, your inactions, your boundaries, your allowances, your inner stories have indeed played the major role in your life as it is…and equally important is the fact that your current circumstances are a result of your interpretation of those events and if you are caught in circumstances that hold you hostage due to your past, you DO have the option to choose to heal, and thus to change your future circumstances. With healing comes a change of vision, of attitude, of gratitude and those things are key in changing your future circumstances. Let me get a little scientific on you for a minute. When you open your eyes do you see the world as it really is? Do you see reality? This is how the book Deviate: The Science of Seeing Differently, by Beau Lotto, starts out. Deviate is a neuroscientist scientific discussion explaining why we don’t, in any way, see reality. Our senses play a limited role in what we perceive, the rest of what we create comes from our assumptions. Our brains have evolved to do this, and it works, but becoming self-aware that our perceptions aren’t reality gives us a space for questioning and breaking out of old stories that hold us back. The fact that we can perceive our own perception is amazing…. How do we step outside the past to live differently in the future? How can you change your way of seeing? How can we become active writers of our own story? Beau Lotto, posits that we do not live in reality – our senses are limited, we can only see a certain range of colors; we can only hear a certain range of sounds. We are aware of only limited dimensions. We have a limited and small window in which we as humans can actually see through. And we know it is small because other creatures have broader ranges of perception than we do. We know other things exist that we do not comprehend through our senses, which is our way of getting information from the world around us. The importance of understanding that we don’t really see reality in the greatest truth of things, is the basis for accepting that we create our own realities – our own stories of what is going on, in order to adapt to our environment and survive. The first key here is that reality is subjective. We create it from the exposure we have had to the environment around us and the things it has taught us. The second key I want to focus on from is research is the plasticity of the brain. It is a scientific fact that the brain is always adapting, learning and changing. This means we keep adapting to our environments, to the experiences we are going through. Old dogs CAN learn new tricks if they want to. We can change our perceptions. We can change our habits. Our mind is always adapting according to its perceptions, which reshapes the networks in our cortex, which is the basis for our behavior: established neural pathways. So his next scientific point is that minds match their ecology; ecology – the interactive relationship between things and the surrounds in which they exist. Studies have shown that people and animals that live in spaces deprived of stimulus, challenge, love, etc. their brains adapt accordingly. Whereas the more alive, different and challenging an ecology, the more the brain steps up to adapt to the higher pace. This is big for parenting and creating atmospheres full of challenge and opportunity certainly, but it also means that as we seek to create our own stories that we CAN change our perceptions of the past, and thus create different futures. We can open ourselves to new cultures and new experiences, which stretches our minds and engages with an ecology that is broader than one where we limit ourselves to a story that comprehends only habit and singular ways of seeing the world. For example, it has been proven that those who travel outside their cultures and have been exposed to broader ecologies have brains that are able to comprehend broader ways of seeing people and life because they have been influenced by diverse stimuli, rather than exposed only to smaller realms of understanding. In this example, people who travel more have actual physiological differences within their brains. Adapting means our brains physically change according to what they are exposed to. Your ecology – or environment -shapes your brain. Your reshaped brain creates a change of behaviors that continue to mold your brain. These adaptations change your future. If I can sum that up it comes down to the idea that our brains have taken in the stimulus of our surroundings, our ecology, and we have established neural response pathways to that information. The brain is reformable, it is constantly adjusting to its environment and so we can broaden our experiences and our outer ecological atmospheres which will help us to expand our perceptions and/or we can reshape our perceptions on purpose by choosing to give different meaning to the events of the past, which as you alter their meaning you then alter future reflexive response, thus you change what you are capable of. We are complex and wonderful enough that we observe our own perceptions and deviate on purpose, time and again, to get to where we wish to be. Like when a pilot makes constant adjustments in order to arrive at the right place. In the movie, I Feel Pretty with Amy Schumer, an ordinary gal who is a little heavy, struggles with feelings of insecurity and inadequacy on a daily basis. The movie does a great job of letting us see inside her self-loathing, which is heartbreaking. So, in the movie she falls off a spin bike at the gym, hits her head and wakes from the fall seeing herself as the most beautiful woman she’s ever seen – exactly what she’s always wanted to be. She feels capable and confident and is empowered to live her life fearlessly, which is extraordinary to watch because nothing about her externally changes, it is nothing more than her own internal story that changes. This movie is what I talk about all the time about the difference our inner stories – the stories we tell ourselves about ourselves—can and do make in the creation of our worlds, of our realities, of our life stories. Watching her interact with men, go after the job she wants, rise to the top of her company because she is no longer self-conscious is this beautiful illustration of what is possible for all of us with this same mind shift. Watch it – if you haven’t, just to see what I mean, bold and big in story form! This simple shift of perception creates such a totally different story and world for Renee, it’s absolutely delicious. But it’s delicious because it applies to all of us. So, scientifically it is proven that we can change our behavior by changing our perceptions. And, as the movie illustrates so beautifully, with those changed perceptions we create a reality with an entirely different outcome – write a completely different story full of such staggering possibility when we lose the self-doubt and self-criticism, or change the past stories that we are stuck in. And then the next step is that in creating this different story, this different future, creating your life on purpose also requires our action. Do the quiet yearnings of your heart create just a space of yearning, or does it create action? I bring this third point up, not to discourage you with tales of work, but rather to point out that creating a life on purpose starts with our thoughts, but it is moved forward by our choices and our actions, and our constant awareness of our perceptions and adjustments in order to get to our destination. For example, every morning I check my internal stories. Every morning I review my positive mantras and change the negative comments that creep in. This is a daily exercise. Every morning I rehearse my gratitudes. But here’s the good news – because of the plasticity of the brain, those positive things start to become the new normal. And that changes the game. 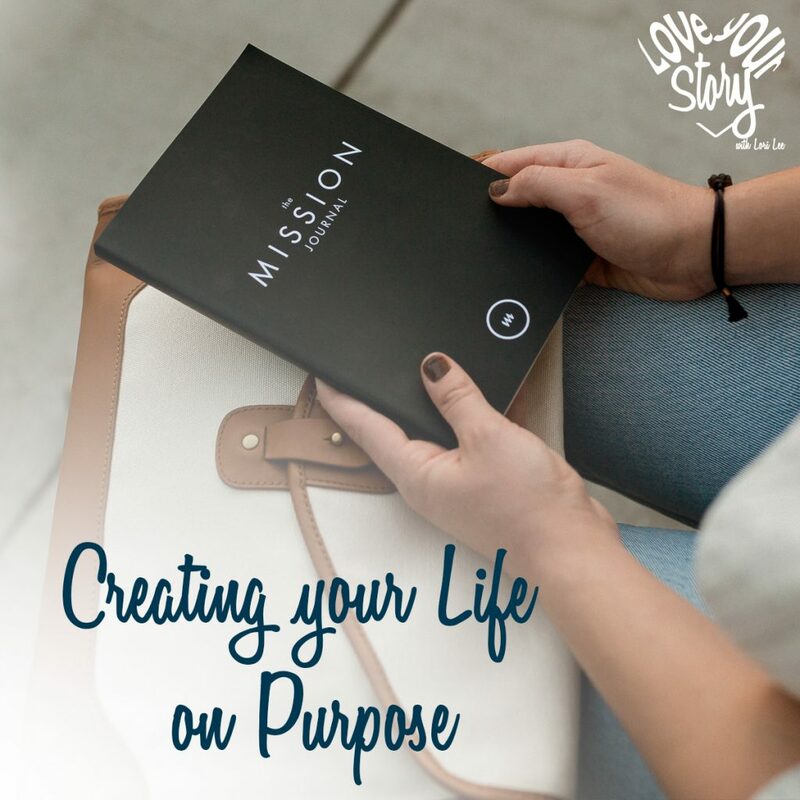 Creating your life story on purpose is about deciding what you want, making choices to get you there, reforming your neural pathways in support of what you’re creating, persistently choosing love and novelty and whatever floats your boat. It’s about deciding and then taking your power to do – to act. If something, some thought, someone feels like it’s stopping you, you have the power and choice to change perception or to change your situation. I want to end with a quick story about a woman who struggled with the all too familiar struggles of creating something she wanted, and how she finally did it. Tune in to the podcast for the interview with Taylor Proctor, the owner and host of the Happiness Abound podcast. Thank you for being with us today for this discussion. Let me sum up the points really quickly. To create our own life story we first have to take responsibility for the power we have to create our own lives. Then we talked about understanding that our perceptions of things going on around us come directly from our experiences and the environment to which our brain has been exposed and thus learned to adapt to and we see this as reality, but it is not reality, it is not fact. Our interpretations of the events around us, things happening to us, thing going on in the world are completely objective and understanding this gives us room for choosing to see things more fluidly, to observe our observation and choose different interpretations that will support our growth. We can choose to reframe old interpretations of our life stories/events which can create space for an entirely different future. Then we talked about the plasticity of the brain and how this reformable aspect of our physiology allows us to create new habits, to broaden our ecologies, to orchestrate our lives. Then we talked about the importance of taking that action to use that plasticity to our advantage in changing our internal dialog – so like we saw in the movie, I Feel Pretty, we can change our actions and our futures. Our lives start with our thoughts – that means those should be the first space we look to when creating our life on purpose. If we have thoughts that hold us back we absolutely want to become aware of them and adjust them. Because they lead to our actions, which progress to our habits, which creates our life stories. Boom! Go forth fellow story creators and have an awesome week orchestrating your own life for your own best happiness. Because if you don’t, nobody else will. A quick reminder to head to loveyourstorypodcast.com to share your thoughts or comments, to sign up for the 21-Day Challenge or the course on reframing the past stories that hold you back, or just to listen to or share other podcast episodes. See you next week. Take Action – Create on Purpose.